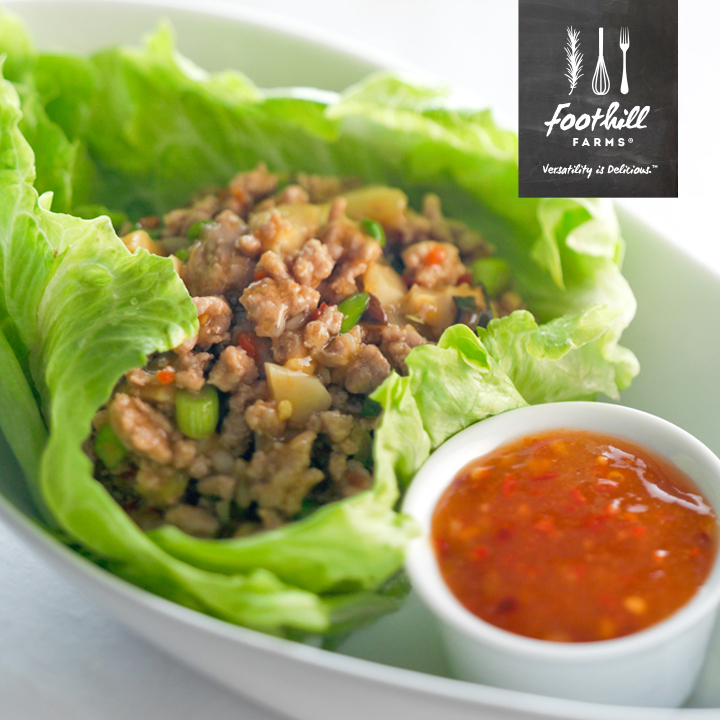 As a leader in foodservice manufacturing, it’s our job at Foothill Farms to stay on the forefront of what people crave. Here are our thoughts on five menu trends we expect to grow in 2015. As a leader in foodservice manufacturing, it’s our job at Foothill Farms to stay on the forefront of what people crave. So we took a look at which of our products have been flying off the shelves, where the overall industry is moving and what our customers are requesting most. Here are the five trends that bubbled up to the top for this year. Ranch is the “girl next door” of dressings. Friendly and familiar by day and surprisingly irresistible when prepped for a night out. “Ranch has an incredible opportunity to be redefined and made (or modified) in house. It can be completely reinvented and used to spice up an old favorite or familiarize a new concept,” Jorge Cespedes, research and development chef at Food IQ, told Flavor & The Menu. And it’s not just about taking salads to the next level. An upgraded ranch dressing can be your signature sauce offered on sandwiches, as a pommes frites or kale chip dip, drizzled over soups or as a taco topping. The possibilities for ranch dressing mix-ins are endless, but going with of-the-moment flavors is an easy way to get noticed. Add some locally grown mint for a refreshing twist, or blend in a superfood like avocado. Give it a hot hit of wasabi or go bold with regional barbecue sauce. Find inspiration and recipes for Curry Ranch, Thai Ranch, Mango Habanero Ranch and more here. Asian and Latin cuisines have trended for years. Why? They infuse a sense of comfort with an invitation to explore. Brothy pho soothes. Slow-cooked carnitas are the epitome of soul food. Meanwhile the exotic marriage of spicy and sweet or smoky and herbaceous lures our palates east and south. In 2015, look for the breakout of Korean, mainstreaming of Vietnamese and upscaling of ramen noodles, according to Technomic. And ever-popular Latin flavors will see in uptick in breakfast offerings, predicts the National Restaurant Association. All you need is Sweet Thai Style Chili Sauce Mix, hot water and a whisk. It won’t just be ethnic restaurants capitalizing on this love affair with Asian and Latin flavors. They’re hitting the mainstream with huevos rancheros on breakfast menus and ramen nights at corner restaurants. Any operation can get in on this trend with the right sauces and seasonings. Get tips on easily adding Sweet Thai Chili condiments, Mandarin Orange Chicken and more to your menu here and find Charro Beans, Orange Chile Brownies and others here. “What do you have that’s healthy?” Is this person looking for something that’s gluten free? Fat or preservative free? Farm-to-table? Made with whole grains or superfoods? Low sodium or high nutrient? Real food? Today what is considered healthy can vary drastically from person to person. It may be about food they think is good for their bodies or food that makes them feel good about themselves. That’s why 2015 is all about a DIY approach. Mix greek yogurt with Cilantro Lime Rice Seasoning for a great tasting fish taco. According to Food Genius, the better-for-you movement has yet to lose steam and is now being complemented by another Millennial-driven trend: customization. So let diners choose from a variety of offerings that cover one or more health concerns. Some of the dishes you already serve may work perfectly as-is. Just start calling out their benefits on your menu (eg, That mac and cheese is already vegetarian). Another quick way to get (and stay) on the radar of today’s health-conscious guests is using sauces and seasonings like Flavorwise to help meet health concerns without sacrificing flavor. Get ready for a sweeping movement back to scratch cooking. It’s all about balancing food and labor costs with preparing home-style dishes back of house. Particularly look for schools to go in this direction as they cut back on reheating processed foods and do more themselves. The challenge will continue to be labor restraints. There are various schools of thought on overcoming this challenge. Some believe that it’s about investing in new equipment. Others, like the principal of Food Systems Solutions LLC Kate Adamick, say “Most school district food service departments don’t need a bigger labor force to return to scratch-cooking, they need a better trained labor force.” Some combination of equipment, labor, training and the right products is likely where the sweet spot lies. Check out Foothill Farms sauces and seasonings to quickly and affordably transform whole foods into mouthwatering, scratch-made dishes. Diners will continue to order them instead of entrées this year, making their meals three plates instead of one. From tapas to dim sum, small plates are still big news. Diners will continue to order them instead of entrées this year, making their meals three plates instead of one. The low-commitment, high-flavor bites satisfy cravings for variety and create a social, sharing experience. They also allow chefs to stretch their legs and dabble in a variety of global flavor palettes. One innate challenge of small plates is that the variety of menu options may mean a need for additional prep and ingredient storage areas. Depending on the complexity of the dishes, more staff may be required too. That’s why sauces and seasonings that bring a big dose of flavor to small plates with little prep or storage will be your best friend in 2015. For small plate ideas, click here. Melissa is a food and fashion freelance writer currently based in Milwaukee, WI. Since 1998, she has written about up-and-coming food trends, shadowed chefs, participated in focus groups and tasted her way across the country in search of the best bites. If you have a question for Melissa or Foothill Farms, please leave us a comment below. For more information about our products and recipes, please visit foothillfarms.com. Foothill Farms Blog at WordPress.com.